Michael Labeit at EconomicPolicyJournal.com: Une Femme Fatale? The notion that the French are enamored with socialism is as common as it is false. France has, since the end of the Second World War, been a semi-capitalist nation (page 21 of 64), i.e., a market economy with an actively intervening central government. The French face a melange of government controls upon economic activity with which to cope, no doubt, but they live, for all intents and purposes, in a free society (no exceptions please - exceptions are like excuses and we all know what excuses are like). The typical narrative on French socialism has been popularized by an overemphasis on particular aspects of French intellectual and political history. Yes, perhaps the serious enthusiasm for a socialist or communist type of collectivism in Europe began with Rousseau and the French Revolution. Yes, there was the 1848 Revolution. Yes, there was the Paris Commune of 1871. And yes, similar, in intellectual and aesthetic depth, to the appeal an anonymous rear end has to my vizsla, a romanticized genre of socialism has seduced and continues to seduce an array of French intellectuals. The threat posed by socialists is a real one, but this and the above events hardly qualify France as a socialist state. Firm sentences for all crimes and reinstatement of the death penalty for "the most heinous crimes"
If one opposes the French social democrats and socialists on the grounds that they champion government intervention in the economy, then one ought to treat the National Front with the same scorn. Choosing between French nationalism and French socialism is analogous to choosing between havoc and calamity. They are united in their opposition to free trade, to liberalization, and in their support for the welfare state. 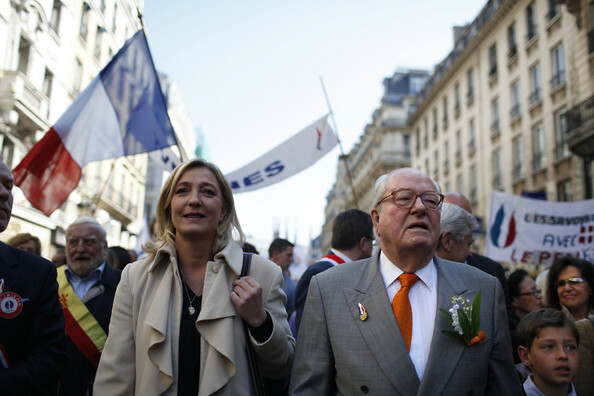 Unfortunately, as economic troubles persist it seems that the approval of the Front will expand, especially given the efforts of Madam Le Pen to curtail the party's crass racial bigotry. As usual, the UMP is the only tolerable alternative. They are perhaps the only real political hindrance to the rise of either the socialists or the nationalists. All one can do is hope that French voters come to their senses. France remains a relatively free country, but this freedom requires the presence of a cautious, ever vigilant electorate. Don't we need better terminology here? France as a capitalist nation? Is any nation truly capitalist? Should we call all states 'interventionist states' and then rate the degree of intervention? If you support a welfare state or a regulatory state, aren't you in agreement with the basic premises of socialism? Obama is not a socialist by technical definition, but isn't he paving the way for some type of socialist state? I hate to let the Left off the hook by not calling them what they in essence are, stealth socialists. And I agree that most people on the "Right" are really just socially Conservative Leftists. That is all that the Front really is. All nations are mixed economies, but it does us no good to then merely identify a country as a mixed economy. France certainly leans more toward capitalism than non-capitalism, hence I've given it the label of "capitalist nation" with a qualification of course. Every nation/region has regulations, including Hong Kong. Shall I then strip Hong Kong of the title "capitalist economy" even though its virtually on the cusp of capitalism? In France, the bulk of factors of production are owned privately, private property in income and real estate is respected to a significant degree, market prices are allowed to change and to govern the majority of transactions, etc. I'd say that it is a capitalist country. I'll add "semi" to "capitalist nation" to underscore the qualification. I understand what you are saying but my point is that saying the France is a "capitalist" nation (or even America) does not give us a true picture of what capitalism is. Yes, there is largely private ownership of the factors of production, private property, market prices, etc. But there is also a massive welfare state, a massive regulatory state, and thousands of other interventionist measure such that today's industrial countries have extremely hampered markets and industries that do not behave like capitalist countries would. In fact, I would argue that a truly capitalist country would be unrecognizable with today's America or France. So then should we still call France and America capitalist? Semi-capitalist is better but I think that it is not improper to identify the socialist elements of modern nations. For example, semi-socialist seems a better fit than semi-capitalist.